Grooveshark is a Flash website that lets you play all kinds of music using an interface similar to iTunes. It can be found at http://grooveshark.com/ . Lately I discovered two things. First, I found out there is an Android (phone) Grooveshark application. To be able to use it you have to pay 3$ a month. With this application I can listen to any music anywhere (in Germany) using my cell phone. I don’t have to download stuff. I just search and play. It’s like having all the music in my phone. I think it’s amazing. 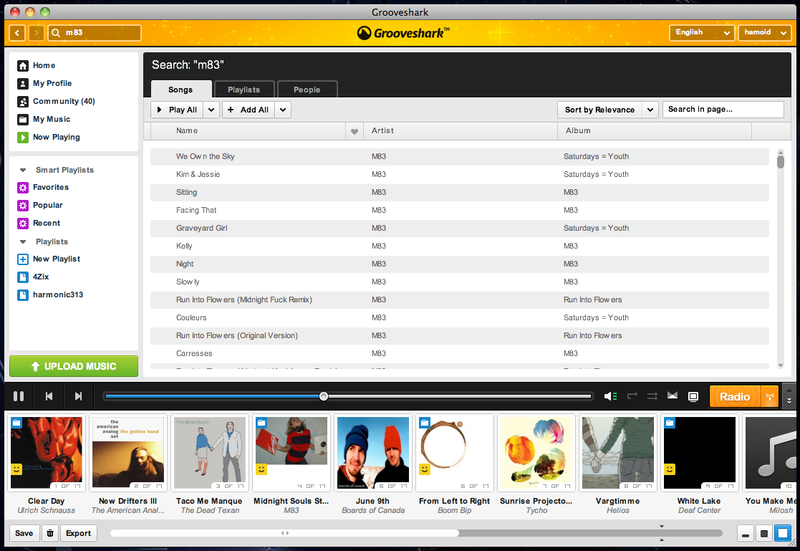 Then today I discovered the Grooveshark desktop application. This application is done with Air, which means it should work on Linux, Windows and OS X. Again, it’s like having an iTunes with all the music inside. This is the way I want to listen to music. I don’t want to own CDs, I don’t want to own music files and I don’t like shopping. What I like is being able to listen to anything any time. I don’t like listening to the same song for the whole day. In that sense, iTunes is expensive for me, because I just like exploring new music, and maybe listening again to a song a few times. I don’t want to pay thousands of dollars for all the songs I want to hear. On the opposite end, I can just listen to YouTube, SoundCloud and online radio for free! I think there is a gap in between free on-line radio and iTunes that Grooveshark is filling. With Grooveshark I can listen in radio mode, which is like an online radio. But with a difference: for each song played I know the song title, the band name and I see the cover image. I can save the track currently playing in my own library with just one click, so I can easily find it later. No need to download or buy. I can also easily share the song on twitter, Facebook or by e-mail with a simple link like “hey, listen to this amazing track”. I can not do that with online radio, FM radio, CDs or iTunes. Another thing I can do with Grooveshark is exploring the music libraries of my friends and contacts. I can listen to what they like. I can also create playlists, share playlists and listen to playlists from my friends. I can even embed songs or playlists in websites. I can upload my own tracks to Grooveshark. And no, they didn’t pay me to write this post :) Since the music and film industries are waging this war suing users while they try to keep their profit margins (in a time where record companies have lost part of it’s meaning for existence), I can imagine them taking some action against Grooveshark. Which would be a pity, because this is an amazing way to experience music.